宫雪, 于柳, 祝兴旺, 刘嘉, 刘屹立, 王平. 抑制Rab11表达对人膀胱癌细胞增殖和侵袭的影响[J]. 中国医科大学学报, 2018, 47(3): 247-250, 259. GONG Xue, YU Liu, ZHU Xingwang, LIU Jia, LIU Yili, WANG Ping. 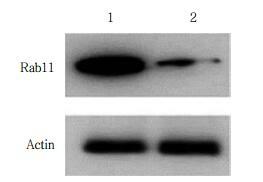 Effect of Low Rab11 Expression on the Proliferation and Invasion of Human Bladder Cancer Cells[J]. Journal of China Medical University, 2018, 47(3): 247-250, 259. Abstract: Objective To investigate the effect of inhibition of Rab11 expression on the proliferation and invasion of human bladder cancer cell line T24.Methods T24 cells were transfected with Rab11 siRNA, and RNA interference efficiency was determined by performing Western blotting. 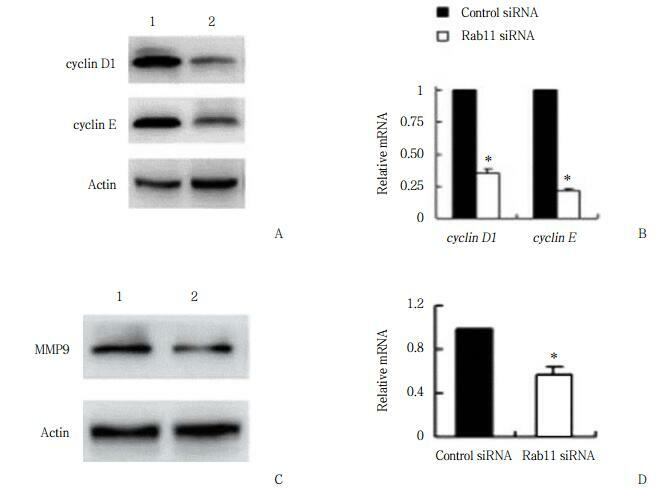 The effect of inhibition of Rab11 expression on cell proliferation, cell cycle progression, and cell invasion was analyzed by performing CCK8, cell cycle detection, and Matrigel invasion assays, respectively. 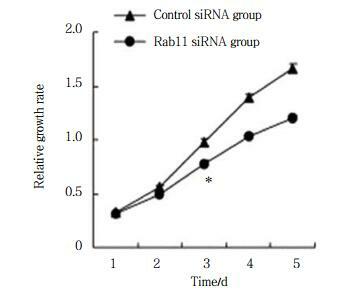 Expression of cell cycle-related proteins cyclin D1 and cyclin E and invasion-related protein matrix metalloproteinase 9 (MMP9) was determined by performing Western blotting and RT-PCR.Results Inhibition of Rab11 expression inhibited the proliferation and invasion of bladder cancer cells and downregulated the expression of cell cycle-related proteins cyclin D1 and cyclin E and invasion-related protein MMP9.Conclusion Our results suggest that Rab11 functions as a tumor protein and is involved in the progression of bladder cancer.